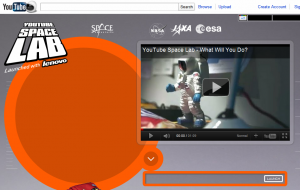 Calling Out the Young Space Scientists: YouTube Space-Lab "Experiment!" For some reason, space was (still is) something that I really loved. I don’t know whether it’s the emptiness of the space or the awareness that put me at “edge”, but I felt alive, every time!. And I absolutely love watching movies that have anything to do with space. Although from experience I think the wondering nature of the mind is another form of aggression … acting out of the fear of the “unknown”, trying to dominate. But as a society in whole, we can certainly “benefit” from the aggression of the youngsters :). You can suggest a science experiment (a video) that can be carried out in space concerning either Biological or Physical science . The judges will be looking for things like how creative you are in your approach + your communication skills. The original idea came from Zahaan Bharmal (who’s in control of Google’s Head of Marketing Operations -- Europe, Middle East and Africa). The judging panel has some big names such as the prestigious Professor Stephen Hawking!. Well, it’s not clear how many winners will be chosen but the prices includes a zero gravity flight, a trip to Japan or Russia and a Lenovo laptop. But above all, if you’re one of the chosen ones, then how would you feel when your science experiment is broadcasting live as it’s performing in the International Space Station!. Remember there’s are some requirements such as a basic age requirement. Only youngsters around 14-18 are eligible + there are certain rules or guidelines that you have to follow which can be found in this official Google Page. So, do you wanna head out for the YouTube SpaceLab or what!. Good luck.